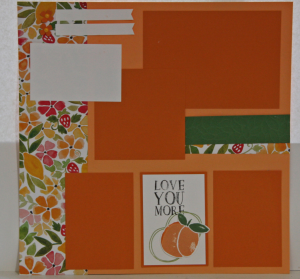 This was a layout that we stamped in August at our Layouts Class. I was hoping to put together a page of some recent photos we've snapped while cherry picking and canning peaches. Canning peaches was on my summer bucket list this year so Ella and I did two cases of peaches. Canned peaches don't last long around here as they LOVE canned peaches. The issue has been I was reminded recently of my cousin Elaine's peach salsa recipe and so I've been craving a little peach salsa. We have oodles of tomatoes and peppers from the garden so I think it would be perfect to make peach salsa. It has brown sugar in the recipe so it's got to be the best stuff out there! I am heading over to a local store that has fabulous produce to pick up some more peaches. This layout will be perfect for a few shots of my kids in the orchards this summer and fall.